Emotion: Side B (stylized as E•MO•TION: Side B) is the second extended play (EP) by Canadian singer Carly Rae Jepsen. It was released on August 26, 2016, by 604 Records in Canada and School Boy Records and Interscope Records in the United States. Jepsen developed Side B as a companion piece to her third studio album, Emotion (2015), in response to fan demand. Side B features unreleased songs that were cut from the original effort. Like its parent album, Side B takes heavy influence from 1980s pop music, with lyrical narratives that revolve around love and heartbreak. Several writers and producers on Emotion reprised their roles on Side B, including Greg Kurstin, Dev Hynes, and Rami Yacoub. The EP received favorable reviews upon its release and was placed on several critics' lists for best of the year. 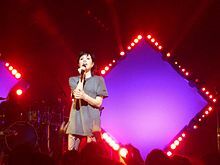 A Japan-exclusive reissue of the EP was supplemented with the song "Cut to the Feeling", a Jepsen single for the Canadian-French film Ballerina (2016). "The metamorphosis of the tracklists I've made for Emotion have probably changed six times. I have a little easel board with it painted on and I'd come home from a session and then I'd write down a song I liked better than having to decide which song to take out. I had to rebuild it and give it a facelift almost every week." Emotion was eventually released in June 2015 to underwhelming commercial reception, despite positive reviews from music critics. The album developed a cult following and Jepsen grew to become a "critical" or "indie darling". She embarked on the Gimmie Love Tour in support of the album in late 2015. She cited repeated requests from fans during the tour to release an "Emotion 2.0" as an inspiration for Emotion: Side B. Speaking to radio station WMSC in March 2016, Jepsen expressed a desire to release these songs, stating that she'd been contemplating an Emotion 2.0-type release. The remix album Emotion Remixed + was released exclusively in Japan on March 2, 2016, marking the first appearance of the songs "First Time" and "Fever", which she began performing on the second US leg of her tour. The EP opens with a distorted cassette-recording of the chorus to "First Time", co-written with the same ensemble behind Jepsen's "Your Type". A synth-funk song, its bubblegum instrumental contrasts with Jepsen's pleas to rekindle a relationship, channeling the "breeziness" of The Jets' "Crush on You". In "Higher", Jepsen sings about a relationship in which she is swept off her feet. Brad Nelson of Pitchfork called it "the most transparent 'love' song" from her Emotion offerings". "Higher" is built upon "fizzy" synths and New Wave drums. Nelson describes its production as invoking "the crisp, fussed architecture of a Scritti Politti song", whereas Esther Zuckerman of The A.V. Club likens it to a Robyn outtake. "The One" is described as "bouncy synthwave-lite", where Jepsen sings about avoiding commitment. "Fever" is placed in the "weird and unstable space just before a breakup", where Jepsen confesses to stealing her boyfriend's bike and riding it to his empty house. Nelson notes that the song is "vacuumed into the throb of a bass drum", alluding to the absence of Jepsen's romantic interest. Entertainment Weekly's Jessica Goodman highlighted "Fever" as standout track, calling it a "devastating karaoke sing-along". "Body Language" is accentuated with 808 drum kicks and handclaps. "Cry" is a mid-tempo ballad sung about an emotionally unavailable boyfriend, recalling the italo disco genre. The song utilizes a synth bass that is "just muted enough to invert its usual effect, generating a feeling of weightlessness". In 2011, Jepsen participated in an anti-smoking campaign for her home province of British Columbia's Healthy Living Alliance coalition known as "Quitters Unite", which featured an unreleased composition that was reworked into "Store". Several critics have noted its "bizarre" nature as a "misleadingly chipper" song about walking out on a relationship, and its carefully sung verses juxtaposed with a "violent waking" of a chorus. Maura Johnston of Rolling Stone describes it as a danceable Dear John letter, while New Statesman's Anna Leszkiewicz calls it a "satire of deadbeat dad tropes". Jepsen wished Emotion a "happy [anniversary]" via social media on August 21, 2016, and announced that she had a "present" in the works. She unveiled the EP's cover artwork in the same post. For the week leading up to its release, Jepsen posted a different song teaser each day across several social media platforms. The track listing was revealed on August 24, 2016, through retailer 7digital Canada. A personal note from Jepsen accompanied Side B's release on August 26, 2016, expressing her gratitude and wishing to reciprocate her fans' support. Side B received a limited physical release on September 9, 2016, with autographed copies, and it arrived on vinyl on December 16, 2016. Though no singles were issued to promote the EP directly, "First Time" had been previously released as a promotional single for Emotion Remixed + and had charted at number 71 on the Billboard Japan Hot 100. On September 13, 2017, Japan received an exclusive reissue of the EP entitled Cut to the Feeling: Emotion Side B + with revised artwork and the only appearance of the single "Cut to the Feeling" on physical CD. "Cut to the Feeling" then peaked at number 13 on the Japan Hot 100, its highest position in the global music market. At Metacritic, which assigns a normalized rating out of 100 to reviews from mainstream publications, the album received an average score of 80 based on 6 reviews, indicating "generally favorable reviews". Pitchfork gave the EP a score of 7.1—close to its score of 7.4 for Emotion—and reviewer Brad Nelson found it to be more of a "continuation" of its parent album rather than a typical assorted B-sides collection, remarking: "[these] are pop songs, gorgeous and direct, but they are also extremely recursive spaces, blushing compressions of time, small infinities of heartbreak." Nelson commended Jepsen's "talent" for maintaining a "person-to-person intimacy" in songs that still sound "enormous". Jessica Goodman of Entertainment Weekly came to similar conclusions about Jepsen's pop persona and highlighted the EP's tail-end summer release: "Her timing shows she couldn't care less about becoming pop's queen bee again—she'd rather throw the coolest party in town. Side B is that bash: intimate yet inclusive, with an invitation personally delivered by hand." Writing for Exclaim!, Jill Krajewski quipped: "if the rollout of Emotion was overthinking it, Side B finds Jepsen coming to a sweet realization: Don't think it over." She praised the EP for its high "single potential" and pondered whether the songs "were all blueprints to 'Run Away With Me', first-drafts of a single meant to define the megahit of [Emotion]. And yet, in their raw state, they show Jepsen at her most powerful and unfettered." In a mixed review, The 405's Mark Matousek said that Side B is "most instructive in the ways it illuminates her process. It lets us peek in on the misfits [...] and hints at the unsexy labor of music-making." Pitchfork's Nelson shared this sentiment, and both reviewers found the tracks "Body Language" and "Store" to be lacking. Entertainment Weekly The 100 Songs of 2016 – "Body Language"
Spin The 101 Songs of 2016 – "Fever"
The Fader The 100 Songs of 2016 – "Store"
The album debuted at number 55 in Jepsen's home country of Canada and number 74 in Australia. In the United States, the album debuted at number 62 on the Billboard 200, earning 9,000 album-equivalent units in its first week, with just over 7,000 coming from pure sales. It also debuted at number 26 the same week on the Billboard Top Album Sales chart. 1. "Cut to the Feeling"
Credits per the liner notes of Emotion Side B. ^ Thompson, Eliza (August 26, 2016). "Carly Rae Jepsen Just Blessed the World With 8 New Songs". Cosmopolitan. Archived from the original on October 27, 2017. Retrieved August 3, 2017. ^ Carlin, Shannon (April 3, 2015). "Carly Rae Jepsen Wrote 250 Songs For Her New Album". Radio.com. CBS Radio, Inc. Archived from the original on September 11, 2017. Retrieved June 2, 2015. ^ a b Gevinson, Tavi (October 16, 2015). "The Next Adventure: An Interview With Carly Rae Jepsen". Rookie. Archived from the original on October 19, 2015. Retrieved August 3, 2017. ^ Lindsay, Cam (August 7, 2015). "Stall Me Maybe: How Carly Rae Jepsen's New Album Took Time". Vice. Retrieved August 24, 2016. ^ Nolfi, Joey (August 21, 2016). "Carly Rae Jepsen announces Emotion: Side B". Entertainment Weekly. Archived from the original on August 22, 2016. Retrieved August 25, 2016. ^ Zaleski, Annie (February 17, 2016). "On "Run Away with Me," Carly Rae Jepsen is the Lead Character of Her Own Fairy Tale". The A.V. Club. Archived from the original on April 9, 2018. Retrieved August 28, 2016. ^ Johns, Gibson (December 2, 2016). "Carly Rae Jepsen Reveals the Direction She Plans on Taking with the Follow-Up to 'Emotion'". Aol. Archived from the original on December 3, 2016. Retrieved August 3, 2017. ^ Arevalo, Ivan (March 26, 2016). "Emotion 2.0? – Carly Rae Jepsen Talks Possible New Album, Gimme Love Tour and More". WMSC. Archived from the original on September 7, 2017. Retrieved August 28, 2016. ^ Donnelly, Eric (August 22, 2016). "Carly Rae Jepsen Releases "Higher" Snippet from 'Emotion Side B'". 103.3 AMP Radio. Archived from the original on August 23, 2016. Retrieved August 3, 2017. ^ a b Leszkiewicz, Anna (September 2, 2016). "Side B: When Cassette Culture Met Carly Rae Jepsen's Brand of Nostalgia". New Statesmen. Archived from the original on September 3, 2016. Retrieved August 3, 2017. ^ Williott, Carl (March 18, 2016). "Hear Two Great New Carly Rae Jepsen Songs from 'Emotion Remixed'". Idolator. Archived from the original on October 30, 2018. Retrieved August 4, 2017. ^ R, Will (August 29, 2016). "Carly Rae Jepsen - Emotion: Side B (album review )". Sputnikmusic. Retrieved August 3, 2017. ^ a b Lambert, Molly (August 31, 2016). "The Pure Pop Perfection of Carly Rae Jepsen's Emotion: Side B". MTV News. Archived from the original on September 1, 2016. Retrieved August 3, 2017. ^ a b c d Spanos, Brittany; Harris, Keith; Johnston, Maura; Soto, Alfred (December 19, 2016). "20 Best Pop Albums of 2016". Rolling Stone. Archived from the original on April 9, 2018. Retrieved December 19, 2016. ^ a b c d e f g h i Nelson, Brad (September 8, 2016). "Carly Rae Jepsen: Emotion Side B Album Review". Pitchfork. Archived from the original on April 7, 2018. Retrieved August 3, 2017. ^ Zuckerman, Ester (December 5, 2016). "Carly Rae Jepsen's Emotion: Side B is Glorious, Surprisingly Deep Pop". The A.V. Club. Archived from the original on August 29, 2017. Retrieved August 3, 2017. ^ a b R, Will (August 29, 2016). "Carly Rae Jepsen - Emotion: Side B (Album Review)". Sputnikmusic. Retrieved October 30, 2018. ^ a b Phares, Heather. 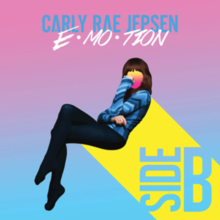 "Emotion [Side B] – Carly Rae Jepsen". AllMusic. Retrieved October 30, 2018. ^ a b c d Goodman, Jessica (August 26, 2016). "Carly Rae Jepsen's 'Emotion Side B'". Entertainment Weekly. Archived from the original on August 29, 2016. Retrieved August 3, 2017. ^ Gibbs, Ryan (August 28, 2016). "Album Review: Carly Rae Jepsen - "Emotion Side B"". The Young Folks. Retrieved August 3, 2017. ^ Carly Rae Jepsen's Smokefree Lifestyle (YouTube video). BC Healthy Living Alliance. October 6, 2011. Retrieved August 30, 2016. ^ Stern, Bradley (December 6, 2016). "The Top 20 Albums of 2016". MuuMuse. Archived from the original on December 9, 2016. Retrieved August 3, 2017. ^ Kornhaber, Spencer (September 3, 2016). "Carly Rae Jepsen, the Most Useful Pop Star". The Atlantic. Archived from the original on September 3, 2016. Retrieved August 3, 2017. ^ Jepsen, Carly Rae (August 21, 2016). "Happy 1 year E•MO•TION! Your anniversary present is coming this Friday 8/26 pic.twitter.com/GXjYO9FsUS". @carlyraejepsen. Archived from the original on August 23, 2016. Retrieved August 4, 2017. ^ Kaplan, Ilana (August 22, 2016). "Carly Rae Jepsen Will Release 'Emotion: Side B' to Celebrate One-Year Anniversary". Spin. Archived from the original on August 23, 2016. Retrieved August 21, 2016. ^ Galbraith, Alex (August 24, 2016). "Carly Rae Jepsen's New 'E•MO•TION: Side B' Songs Are A Freefall Sugar Rush". Uproxx. Archived from the original on August 25, 2016. Retrieved August 24, 2016. ^ Martinelli, Marissa (August 22, 2016). "Carly Rae Jepsen Is Releasing a Collection of Emotion B-Sides, and It's Coming This Friday". Slate. Retrieved August 4, 2017. ^ Williot, Carl (August 24, 2016). "Preview All Eight Songs from Carly Rae Jepsen's 'Emotion: Side B'". Idolator. Archived from the original on October 30, 2018. Retrieved September 7, 2016. ^ Wright, Hayden (August 26, 2016). "Carly Rae Jepsen Releases Surprise 'Side B' of 'Emotion' Album". Radio.com. Archived from the original on August 27, 2016. Retrieved August 4, 2016. ^ a b "Emotion Side B Autographed CD + Digital". Carly Rae Jepsen. Archived from the original on January 27, 2017. Retrieved August 4, 2017. ^ "Carly Rae Jepsen - Emotion Side B". Bull Moose. Archived from the original on April 20, 2018. Retrieved August 4, 2017. ^ "Billboard Japan Hot 100 (Week of April 18, 2016)". Billboard Japan (in Japanese). Archived from the original on April 13, 2016. Retrieved August 4, 2017. ^ "Japan Hot 100 – The week of September 30, 2017". Billboard. September 30, 2017. Archived from the original on October 5, 2017. Retrieved March 5, 2018. ^ a b "E-MO-TION Side B Reviews, Ratings, Credits, and More". Metacritic. Retrieved May 22, 2017. ^ a b c d Krajewski, Jill (September 1, 2016). "Carly Rae Jepsen – Emotion: Side B". Exclaim!. Archived from the original on September 2, 2016. Retrieved October 30, 2018. ^ a b Matousek, Mark (September 16, 2016). "Carly Rae Jepsen - Emotion Side B". The 405. Archived from the original on September 17, 2016. Retrieved October 30, 2018. ^ "The 10 Best EPs & Mixtapes Of 2016". Idolator. December 7, 2016. Retrieved December 7, 2016. ^ "Top 20 Albums of 2016". MuuMuse. December 9, 2016. Retrieved December 9, 2016. ^ "Gorilla vs. Bear's Albums of 2016". Gorilla vs. Bear. December 1, 2016. Retrieved December 4, 2016. ^ Lloyd, Kate (December 12, 2016). "The Best Albums of 2016". Time Out London. Archived from the original on September 26, 2018. Retrieved October 30, 2018. ^ Lindsay, Cam; Carlick, Stephen (December 16, 2016). "Exclaim! 's 10 Best EPs of the Year". Exclaim!. Archived from the original on April 25, 2017. Retrieved October 30, 2018. ^ Fowler, Luke (December 9, 2016). "The 60 Best Albums of 2016". Pretty Much Amazing. Archived from the original on December 11, 2016. Retrieved October 30, 2018. ^ "25 Great EPs From 2016". Stereogum. December 2, 2016. Retrieved December 4, 2016. ^ "Albums of the Year". The A.V. Club. December 5, 2016. Retrieved December 5, 2016. ^ Pitchfork Staff (December 6, 2016). "The 20 Best Pop and R&B Albums of 2016". Pitchfork. Retrieved December 6, 2016. ^ "15 Best Albums of 2016". date. Teen Vogue. December 18, 2016. Retrieved December 18, 2016. ^ "The 100 Songs of 2016". date. December 10, 2016. Retrieved December 10, 2016. ^ "The 101 Songs of 2016". date. Spin. December 15, 2016. Retrieved December 15, 2016. ^ "The 115 Songs of 2016". date. The Fader. December 14, 2016. Retrieved December 14, 2016. ^ a b "Carly Rae Jepsen Chart History (Canadian Albums)". Billboard. Retrieved September 7, 2016. ^ a b "Chart Watch #384". AusPop. September 3, 2016. Archived from the original on September 3, 2016. Retrieved September 3, 2016. ^ a b "Carly Rae Jepsen Chart History (Billboard 200)". Billboard. Retrieved September 7, 2016. ^ Caulfield, Keith. "Billboard 200 Chart Moves: Ariana Grande's 'Dangerous' VMA Gain, Carly Rae Jepsen's 'B-Side' Set Debuts". Billboard. Archived from the original on September 9, 2016. Retrieved September 10, 2016. ^ a b "Billboard Top Album Sales". Billboard. Archived from the original on September 28, 2016. Retrieved November 25, 2016. ^ "GFK Chart-Track Albums: Week 35, 2016". Chart-Track. IRMA. Retrieved September 2, 2016. ^ "NZ Heatseeker Albums Chart". Recorded Music NZ. September 5, 2016. Retrieved September 2, 2016. ^ Chart Log UK: "CLUK Update 3.09.2016 (wk35)". UK Albums Chart. Zobbel.de. Retrieved September 18, 2016. ^ "Emotion Side B". Archived from the original on October 30, 2018. Retrieved October 30, 2018 – via Amazon. ^ "Emotion: Side B (Vinyl)". March 3, 2017 – via Amazon.